Coleman Racing Product is a leading supplier of quality innovative circle track racing components. 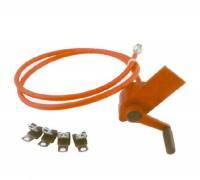 Aluminum Brake Evacuation and Cooling Ducts are used by all the top stock car and other racing teams. Heavy duty straight vane Coleman GT SERIES STRAIGHT VANE ROTOR - is 1. 00" thick and 10-1/2" diameter. 10 bolt pattern. Use with Coleman Sportsman billet steel hub and stock caliper. Pit Stop USA is The Online Motorsports Superstore! We feature Drive Flanges at low everyday prices. Pit Stop USA is The Online Motorsports Superstore! We feature Dust Covers & Caps at low everyday prices. Pit Stop USA is The Online Motorsports Superstore! We feature Kill Switches at low everyday prices. Coleman Aluminum Clamp-On Accessory Mount - 1-1/4"
Coleman Aluminum Clamp-On Accessory Mount - 1-3/4"
Pit Stop USA is The Online Motorsports Superstore! Coleman Racing Product is a leading supplier of quality innovative circle track racing components. Coleman Aluminum Driveshafts are made from 3.0" O.D. x .125" wall aluminum tubing, fitted with super durable 6061-T6 billet aluminum end yokes and GM 1310 series (1-1/16" x 3-7/32"] u-joints, and can reduce rotating weight by up to 8 lbs. Coleman Slip Yokes are the perfect complement to a Coleman driveshaft. Coleman ProLite Steering Quickeners are compact, CNC-machined aluminum, anodized for corrosion resistance and weigh just 2-1/2 lbs. Coleman Rear View Mirrors is a large 5" diameter flat face mirror that gives optimal side and rear vision. Coleman Wide Angle Mirror has up to three times more visibility than most standard mirrors. Coleman Adjustable Aluminum Gas Pedal with Roller Bearings features roller bearings and a nylon roller foot pedal smooth acceleration off the corners for better throttle "feel". Coleman Sportsman Billet Steel Hubs are a direct replacement for '80-up GM metric hubs, they weigh just 10 lbs. and accept stock bearings, races and dust caps. Coleman Sportsman Rotors are heavy duty straight vane rotors for use with Coleman billet steel hub and stock caliper. Coleman Rod Ruler quickly and accurately measures tie rods, trailing arms, upper third links or any linkages fitted with rod ends. Coleman Aluminum Brake Ducts are durable, 3" brake ducts that will not crush when the clamp is tightened. Coleman Threaded Wide 5 Wheel Spacers are made from billet aluminum and are available in several thicknesses. Coleman 2:1 Brake Bias Adjusters are CNC-machined billet aluminum housings have extra long handles with bearings, billet aluminum cranks and heavy duty bronze gears and bushings. They are the smoothest brake adjusters, ideal for race cars requiring constant brake adjustments. We feature Coleman Racing Products at low everyday prices!